From beginning of the fountain pen production Pelikan has a large quantity of different nib engravings. Here you will see a selection as a documentation if you are interested. The Pelikan logo appears in two variations. First with broken lines and second with smaller compact lines. 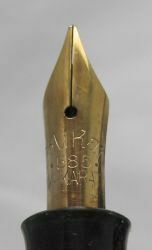 The nib with the heart-shaped air hole (1929) was produced from Montblanc, also the nibs with the round air hole until 1934. After this the nibs would produced from Pelikan at their own metalwork facility. As a result of gold shortness in 1938 until 1949 Pelikan installed first of all nibs from Palladium (Pd) later than only nibs from Chrome Nickel steel (CN). The nib quality is with regards to their writing quality near the gold nibs. 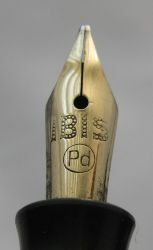 For the models Rappen and IBIS Pelikan produced own nibs with the engraving Rappen and IBIS as the pictures below point out. But also the complete range of Pelikan nibs from the model 100 and 100N were available.